The K-12 Student Outreach Program offers various science, mathematics, and technology-content-based courses for students in 1st through 12th grade. Registration for Summer Camps for 2nd through 12th graders is open now! The Academies for Young Minds camps encourage children to be innovative and use creative problem-solving by engaging them in fun, hands-on activities. Sixteen camps are available for the summer of 2019 — five full-day and eleven half-day in duration. For half-day camps, students can choose to attend either a morning or afternoon session or two camps on the same day. Click here for more information and to register for the 2019 Summer Camps. The Engineering Design Summer Camp, offered through the K-12 Student Outreach Program at Colorado School of Mines, provides an opportunity for high school students to attend a weeklong summer camp on the Mines campus in Golden, Colorado. The objective of the camp is to guide participants through a fun and rewarding hands-on experience of authentic engineering design practices. How will high school students experience this process? Participants will follow a condensed form of a management sequence for engineering design. They will spend two days creating a conceptual design for a specific device. Guidance will focus on the visualization, team formation and project documentation to demonstrate the feasibility of their devices. This phase will culminate with a management design review to sign off on their drawings. For the next two days, they will create, model, and refine their device prior to building a test prototype to compete in the challenge. Following construction, they will undergo a readiness review to assure their device meets project specifications. On the final day, teams will compete in oral and marketing presentations as part of the final exhibition of the team's product. The product will conclude with a ceremony celebrating the successes of all participants. What is the value of such an experience? Engineering Design is a means to solving open-ended problems. It is a life skill that can be applied to many other situations – not just the technical world of engineering. 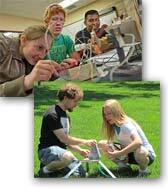 Students will be challenged to invent, to create, to design, and to build. They will experience the satisfaction of an exciting activity, resulting in their very own unique product. They will learn to listen to and to respect the ideas of their teammates. And most of all, they will learn the confidence to resolve their own open-ended problems, and the ability to apply engineering concepts to them. Students must be entering in the fall of 2019 one of the grade levels shown for a camp in order to participate. Please be sure to check the grade levels associated with each camp, since not all camps are available for all grade levels.